Anyone know where you can grab a great tuna salad? 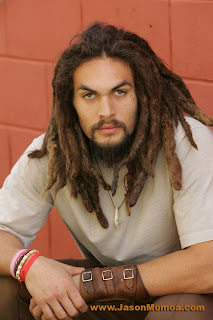 Jason Momoa, the actor whose swum his way through plenty of episodes of Stargate Atlantis and Baywatch has finally landed what could be his big break; the title role in Marcus Nispel’s Conan movie. The catch - there's no time for a victory beer or party, with filming set to start in a mere eight weeks, the very in-shape Momoa, needs to bulk up at a rate that would make Bruce Banner envious. While recreating Arnies infamous silhouette is a mission impossible for most, movie-makers have atleast got to get Jason looking like he could tear flesh from limb and have a good time doing it. The next signing on the list; Conan's father, currently being offered to Sin City/Iron Man 2 comeback king Mickey Rourke. That guy looks about right...but Mickey Rourke, in a Conan movie? NO NO NO NO NO, by Crom! Old Mickey Rourke is becoming a bit of a go-to guy isn't he Rob!